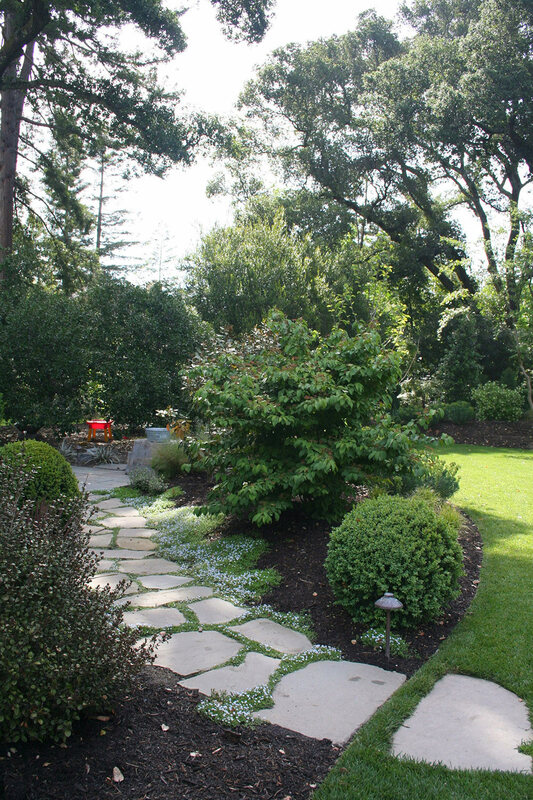 Circulation around your landscape is just as important as the design elements themselves. In fact, the design aesthetic directly influences the materials selection for each pathway. 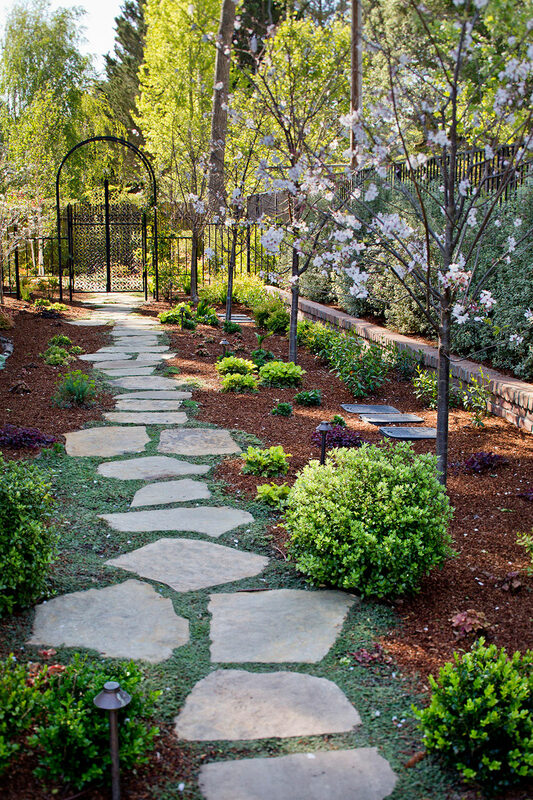 Stepping stone (or paver) paths are a popular design feature that can introduce plant material to an otherwise hardscape dominant palette. 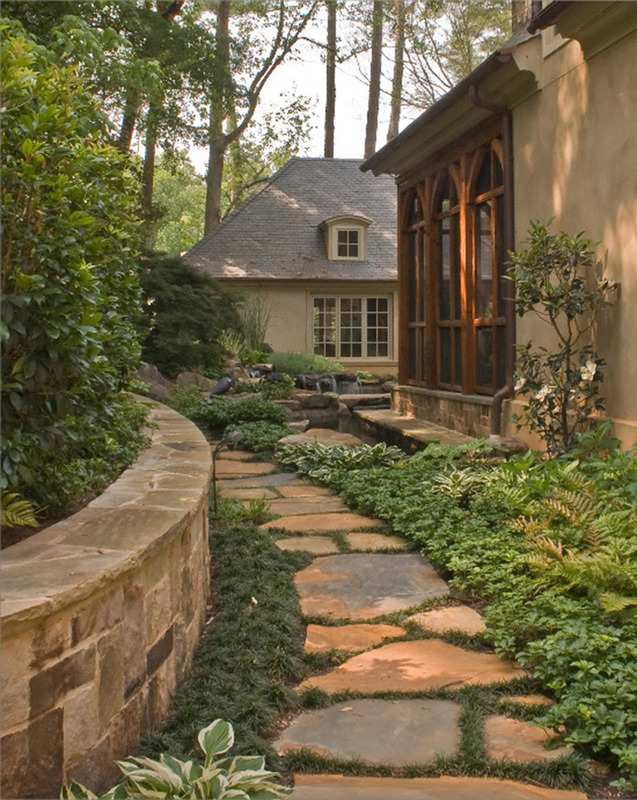 Planting between pavers is a good solution for making a path more subtle and discreet. Naturally, the softened look lends itself to informal pathways as well, where foot traffic is less concentrated. As an added functional bonus, planted joints also help discourage weeds in your path by blocking sunlight in the gaps. Plant material for growing in joints should be chosen carefully. As with most designs, low maintenance, drought tolerance, and year round interest all still apply. But the most important factor to consider is the plant’s capacity to take foot traffic. If the plant cannot handle foot traffic, it will most likely fail to deliver on any level of aesthetic. This article will discuss suitable plant material for use in planted joints, broken down by sun and shade preferences. A very reliable choice for full sun, dry conditions is Thyme (Thymus serpyllum or pseudolanuginosus.). These particular types of Thyme stay low to the ground, between 1- 3 inches. As they creep along the ground, they create uniform mats of foliage. Thyme handles foot traffic very will and will also tolerate sporadic watering once established, making this plant a solid candidate for stepping stone paths in full sun and dry conditions. Elfin Thyme (serpyllum) forms tiny leaves, appearing fine in texture. Woolly Thyme (pseudolanuginosus) appears fuzzy in texture due to the little pubescent leaves. Both will bloom tiny pink flowers in summer. 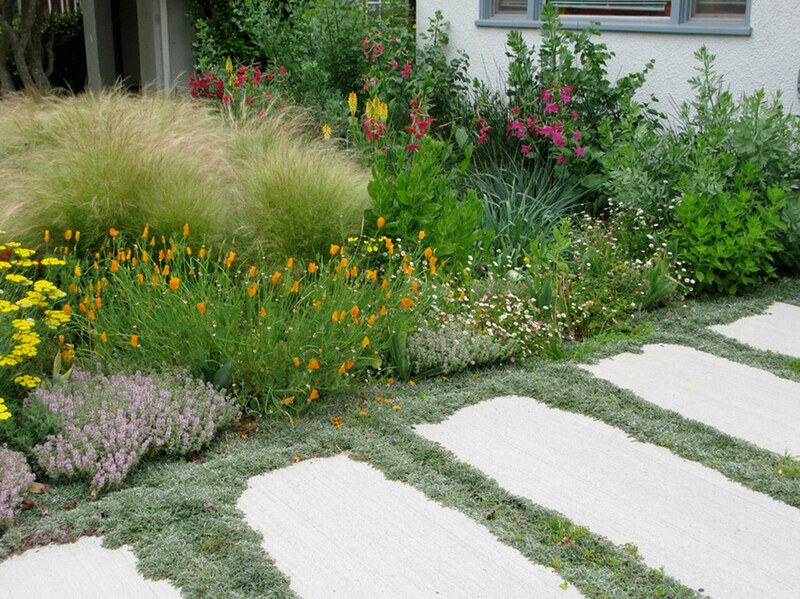 Silver Carpet (Dymondia margaretae) is an alternative to Thyme that can withstand similar conditions. It forms small oval leaves with an overall greenish-gray color. The two-toned leaves naturally curl upwards, offering a slightly more complex texture compared to mostly uniform appearance of Thyme. Small yellow flowers bloom in summer, but the overall height still remains around 2 inches. These plant choices will tolerate full sun conditions, but will perform better with some shade and consistent watering. Blue Star Creeper (Isotoma fluviatilis) forms a lush green carpet sprinkled with tiny pale-blue flowers in Spring. The smattering of flowers gives this plant a very light tone that will contrast against darker materials. Weekly watering with well-drained soils yields solid results. Cranesbill (Erodium reichardii) tends to appear lumpy, bearing round leaves with scalloped edges. 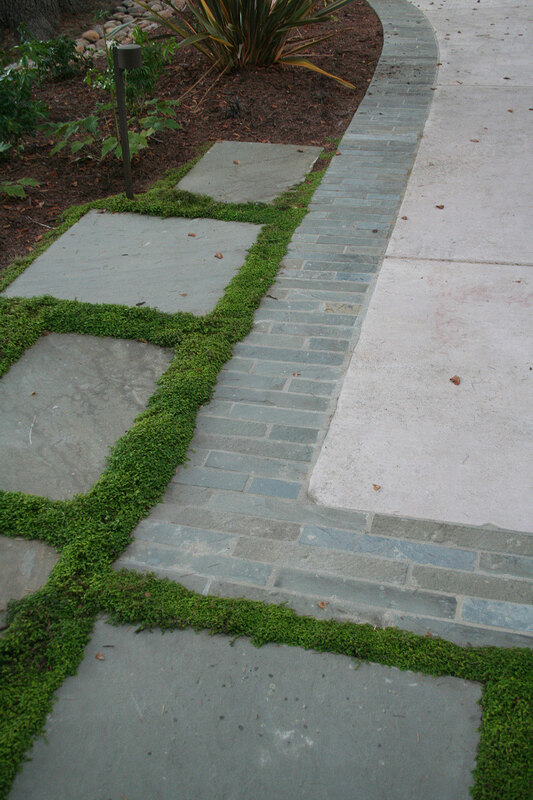 The deep green color provides a rich joint that will contrast with lighter materials in the path. 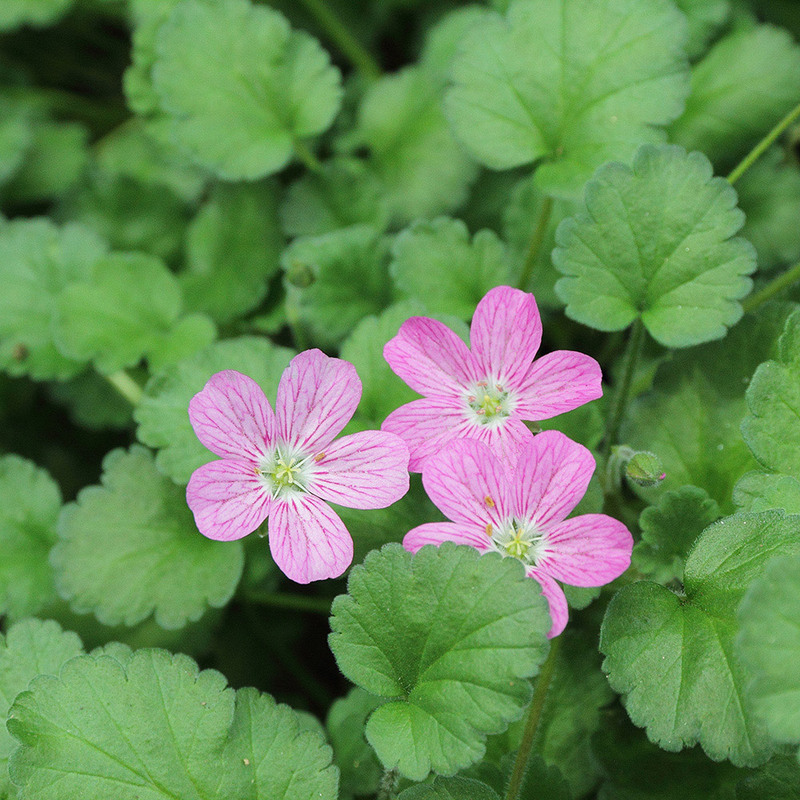 In Spring through Summer, star-shaped pink flowers will pepper the carpet of foliage. 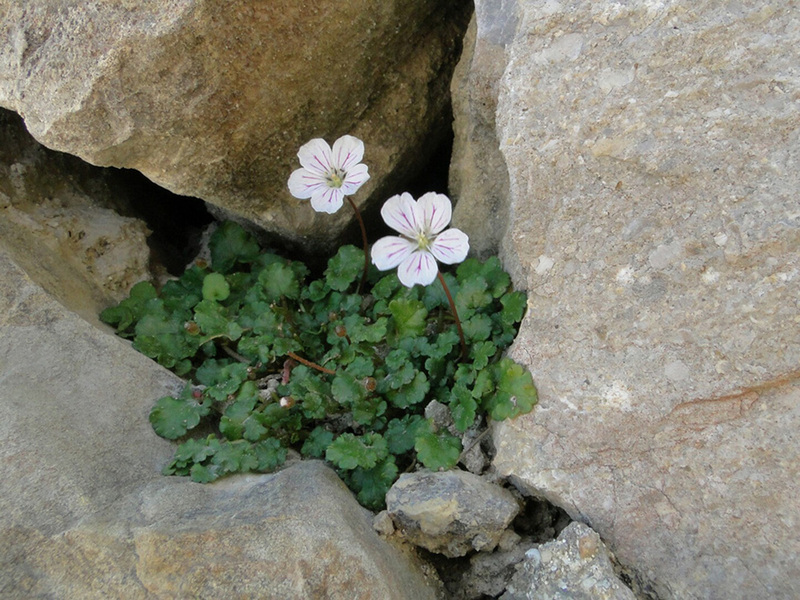 Erodium reichardii ‘Album’ is a popular cultivar featuring white flowers instead. These plant choices are for conditions beneath trees, adjacent to vertical structures, or other areas with limited direct sunlight. Dwarf Mondo Grass (Ophiopogon japonicus ‘Nanus’) will form a lumpy but lush green carpet around 3 inches high. The color is very uniform throughout and the leaves give the appearance a soft, feathered texture. 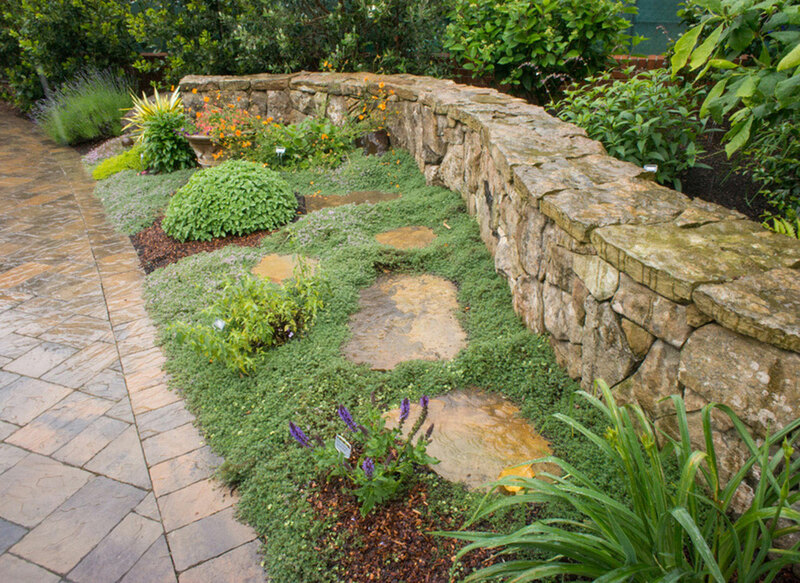 Mondo Grass in general is slow growing by groundcover standards, so it is recommended to plant the clumps closer together to fill in the gaps sooner. Performs better with regular water. 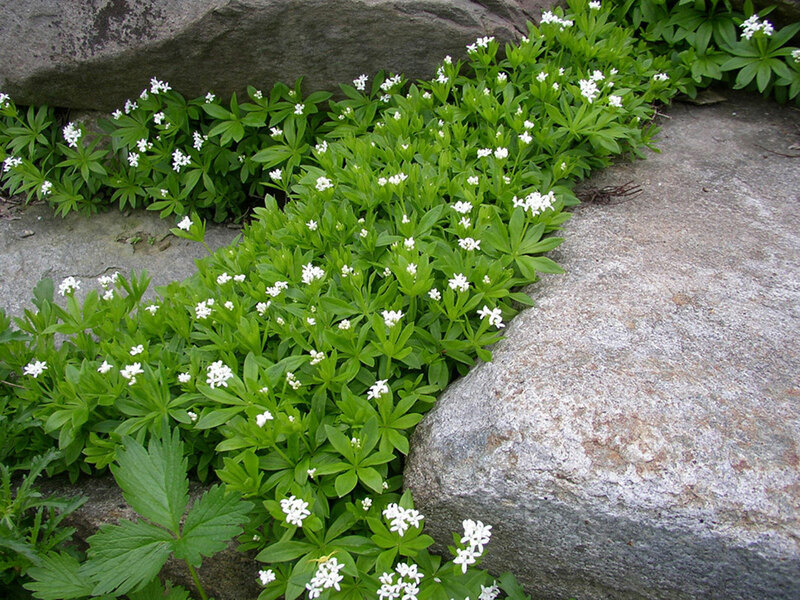 Source: Houzz – Land Plus Associates, Ltd.
Sweet woodruf (Galium odoratum) forms a mat of tiered star-shaped leaves up to 4 inches high. A distinct characteristic is the vanilla scented foliage, adding a layer on complexity to the material. Small tufts of white flowers bloom on high stems in Spring and Summer. Performs well with weekly waterings. This is just a few planting options, with many other out there!